At Arbonne, we want beauty to be an extension of skincare. We know how important it is to help your skin feel nourished, pampered, and just simply, beautiful. Combining a mix of moisturising botanicals and age defying ingredients, our makeup helps your skin look and feel fabulous. Botanical containing antioxidant properties; helps deliver moisturising benefits to soothe the eye area exposed to environmental dryness. Helps blur the appearance of fine lines and wrinkles, giving a soft focus effect. Smooths skin texture; primes skin; provides long lasting hydration. 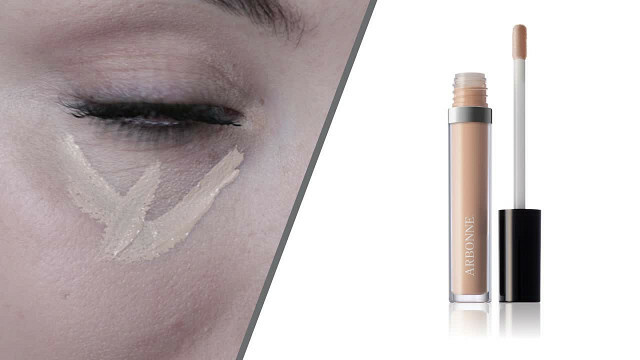 Alfalfa and chicory extracts; conceals to help reduce the appearance of dark circles under the eye area. Our 13 in 1 CC Cream contains mineral SPF and creates a breathable “second skin” to protect you from everyday pollution as small as PM 2.5 microns, which lingers in the air and can stick to the skin’s surface. Lightweight formula camouflages skin imperfections with medium coverage for a radiant finish. Phytinol™ and argan oil moisturise to help the formula support the appearance of skin tone and smoothness. Available in four shades. | 30 ml. The real deal. This lightweight formula offers buildable, full coverage to conceal dark circles, imperfections, and the visible signs of ageing, while delivering ingredients to brighten and hydrate the skin. The flexible paddle applicator helps easily apply the perfect amount of product. Available in seven hydrating shades. The perfect brush to use with The Real Conceal Liquid Concealer. Our dual ended concealer brush offers versatility and flexibility. From dark circles to blemishes, this brush is the ideal tool to help hide any imperfections. The flat, tapered tip provides concentrated coverage, and works great for precise application. The larger brush end helps blend makeup and provides an airbrushed finish. Smooth as satin. Our dreamy foundation protects, moisturises, and creates the look of firmer skin. Minimises the appearance of fine lines and wrinkles while providing medium to full coverage. The best of beauty and skincare come together to provide smooth, lightweight to medium coverage, concealing blemishes and dark spots, while delivering high-performance skincare. Available in four buildable shades that can be combined to create your match. Give your complexion the look of perfection. For flawless, naturally beautiful skin, try our silky smooth, feather light mineral powder foundation to conceal imperfections and provide buildable coverage. This luxuriously soft, dense brush tip holds powder in place without a mess. The domeshaped bristles are ideal for applying loose powder evenly. Blend to create a natural, flawless looking complexion. Specially designed for use with Got You Covered Mineral Powder Foundation. For touch ups on the go, our soft pressed powder delivers natural looking coverage. Polished and beautiful in seconds. Always be ready for a close up. This luminescent, weightless translucent loose powder sets any foundation or makeup for a long lasting, flawless finish. Have a brush with greatness. Our specially designed brushes give you all the tools to create the perfect beauty look. You’ll love their super soft feel and natural wood handles — plus they come in a chic canvas case with a pocket for makeup extras. Six brushes: Liquid Foundation, Powder, All Over Eye, Shading, Slant, and Cheek. Transform your complexion to perfection. For flawless, naturally beautiful skin, try our silky-smooth, feather-light mineral powder foundation to conceal imperfections and provide buildable coverage. The Real Conceal Liquid Concealer blurs the appearance of fine lines and wrinkles and helps reduce the appearance of dark circles. Available in seven shades — try it with the Arbonne Concealer Brush for optimal coverage results. Play up your best feature with colorful shades and eye-enhancing products that beautify, luminize, and define.